Published in Rafu Shimpo, September 25, 1970, Japanese section. 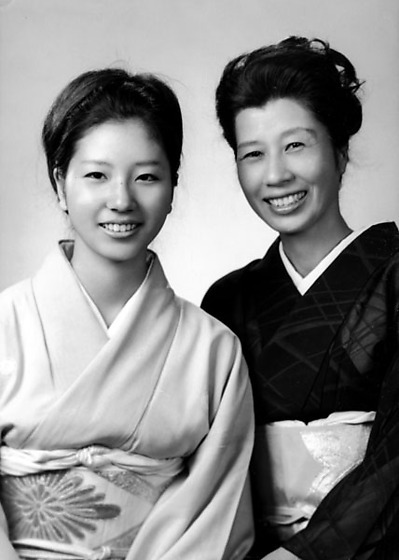 Studio half-portrait of Yoshitsuki Kikukawa, an odori (Japanese dance) teacher and her daughter, Kumiko Tsukiashi, who received natori, or professional title, of Kumiyoshoi Kikukawa, in Little Tokyo, Los Angeles, California, September 24, 1970. Both women wear kimono; daughter wears light colored kimono at left and mother wears dark kimono at right. Typed on original envelope: Kikukawa Odori Teacher -- Natori & daughter together.